Annapolis, MD; September 6, 2017–As an entomologist with an artistic flair, Carly Tribull, Ph.D., frequently uses a novel approach for conveying science to non-academic audiences: comics. Her work–such as the illustrated series Carly's Adventures in Wasp Land, which introduces kids to social, solitary, and parasitoid wasps–is just one example of innovative methods for delivering science to the public featured in a new Science Communication Collection in the September 2017 issue of the Annals of the Entomological Society of America. Now more than ever, communication is a critical skill for scientists, and the Annals has published its collection on this topic to get entomologists talking about science communication. The collection features Tribull's article, "Sequential Science: A guide to communication through comics," along with six other new papers from the entomological field showcasing success stories and insights on various forms of science communication. One article shares lessons learned when entomologists took to Twitter to encourage a young girl's passion for insects in the face of bullying. Another outlines a framework for museums and collections to engage the public online. "The concept of communication involves the creation of understanding between at least two entities, surely the hallmark of civilization. Nowhere is this more important than among scientists, and between scientists and the rest of us, especially in a time of pervasive misunderstanding such as we have now. That's the way global understanding and civilization advance," says Lawrence E. Hurd, Ph.D., Herwick Professor of Biology at Washington and Lee University and editor-in-chief of the Annals of the Entomological Society of America. "Entomologists, as members in good standing of the community of scientists, have an obligation to explain themselves to each other, and to others in society. The papers in this special collection are explorations of how we hope to accomplish this. The methods and rationales are not unique to entomology, and so we hope these contributions will serve to stimulate the conversation beyond the borders of arthropod biology." In January 2017, the Annals of the Entomological Society of America entered its 110th year of publishing and did so with a new scope, aimed at providing a forum for entomologists of widely divergent specialties to share their insights across disciplines. The Science Communication Collection, compiled by entomologist Margaret Hardy, Ph.D., reflects that focus on breadth of interest, both in its overarching theme and the diversity of papers within. Science communication also will be an important theme at Entomology 2017, the annual conference of the Entomological Society of America, in Denver, November 5-8, and the Annals collection will prepare readers for the broad slate of presentations and symposia planned on science communication topics. Print copies of the September 2017 issue of the Annals will also be distributed to Entomology 2017 attendees. 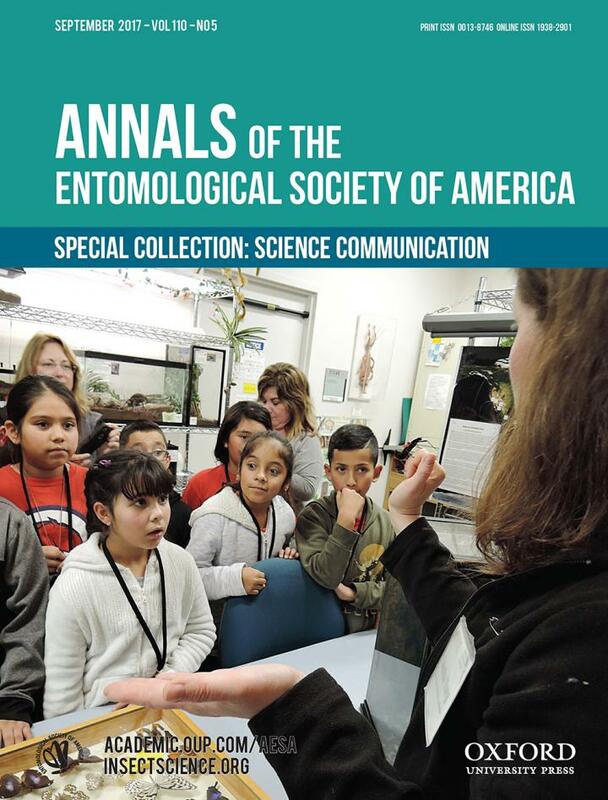 The Annals Science Communication Collection is available now online; the full September 2017 issue of the Annals of the Entomological Society of America will be published September 13. The Annals of the Entomological Society of America publishes cutting-edge entomological research, reviews, collections of articles, and discussions of topics of broad interest and national or international importance. It aims to stimulate interdisciplinary dialogue across the entomological disciplines and advance cooperative interaction among diverse groups of entomologists. For more information, visit https://academic.oup.com/aesa, or visit https://academic.oup.com/insect-science to view the full portfolio of ESA journals and publications.